Add To Ignore List I remember going to the broads when I was a kid and on the southern part of the broads there was a pub set back from the river up a bit of a hill, I remember the pub was quite large and maybe was a B+B as well. I think it was called The Waveny and situated on the Waveny river but I have tried and tried to find it on Google Earth with no luck. Does anyone know where this place is / was and if so where is it exactly. We were there a couple of days ago, it has changed a lot over the passed year!! It is in the 'Pub Guide' in red at the bottom of the page. Add To Ignore List I think you are referring to the Waveney Inn at Burgh St Peter. You'll find it somewhat different to how you remember it. Attached is a photo from 1998. No, your not. 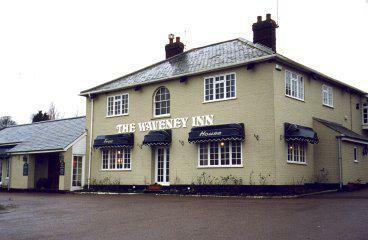 The holiday park is Waveney River Centre (google "a fish called eddie") of which the Pub is now an integral part. Add To Ignore List Ben, just curious, when were you last at the Waveney Inn? Back in the 1970's I was the licensee for a short period. I seem to remember back in the 70's a huge dove cote there just off the river front. http://www.reelbearings.co.uk are suppliers to the worlds top casters and anglers.